Jordan has been on the site before, sharing his work with us. And now he is back to share his bag with us. And what a beauty it is, pure eye candy. Check it out. Hey guys I’m J and I’m back with a bag submission this time. I was fortunate enough to have some of my work featured by Bellamy earlier and I thought it was time for me to finally submit my bag. 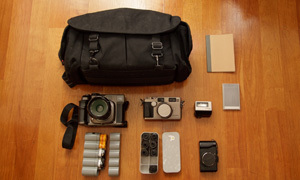 This is primarily my travel bag and I couldn’t be happier with it. An ONA Leather Prince Street in Antique Cognac – An amazing Christmas Present my girlfriend recently got me. If I needed to I could probably fit my life into it and still not have it appear over burdening. Everything about this bag just works and it definitely feels like a life long purchase. A Leica M6 – What can I say about this camera that hasn’t already been said? It’s a work horse, trusted and steady. With that being said it’s definitely missing something. I’m lucky enough to also own a 1966 M4 and everything about that camera does feel right. 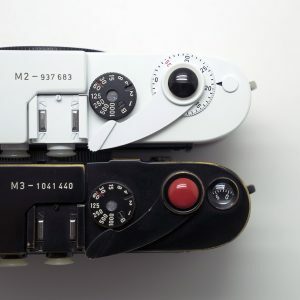 I always thought purists were sitting on their high horses about pre-M5 Leica cameras but they might actually be onto something……can’t beat the convince of that in camera meter though. 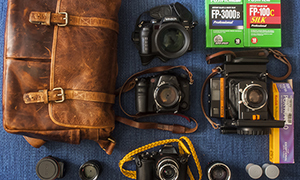 A Voigtlander Color-Skopar Pancake 35mm f/2.5-M (PII) – This lens is stunning. Would buy again. If they made this lens for every mount I have a camera in I would buy another copy of it for each. A Yellow Filter – I’ve been shooting a lot of black and white lately which makes this a must have for me. 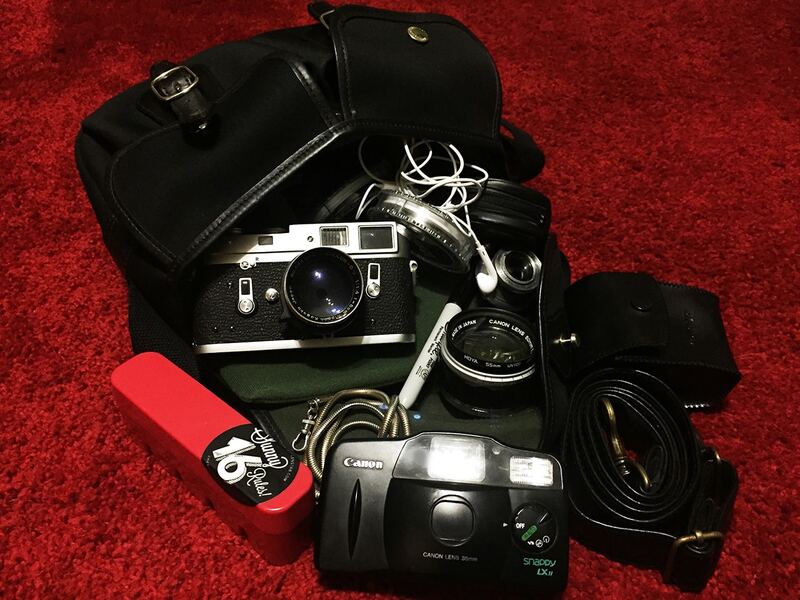 Not pictured but also in my bag and quickly becoming my favorite film stock are two rolls of Rollei Retro 80s. 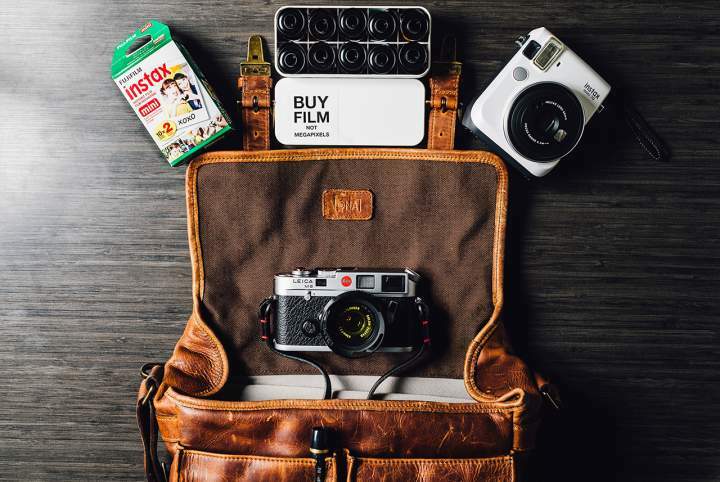 A Fuji Instax Mini 70 and film double pack – A cheap and people friendly camera that’s turning into a burning money pit of addiction. This camera is entirely to much fun for it’s own good. I’d love for you to look at more of work which can be found listed below. Thanks once again Bellamy and I hope to run into some of you out there one day. Thanks for sharing your bag with us, Jordan. That bag looks very nice, I might have to have a look at them. 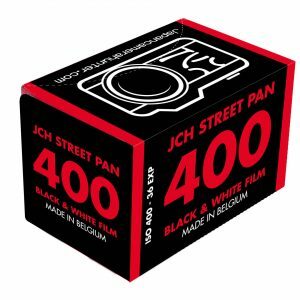 NextFilm News: Announcing JCH StreetPan 400 film! excellent work on your website. cool bag as well. 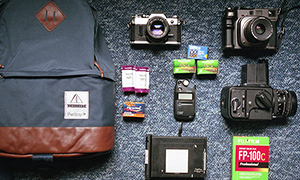 You’ve put together a good bag, and your work is honest and original. I can’t agree with you more about the tiny Voigtlander. 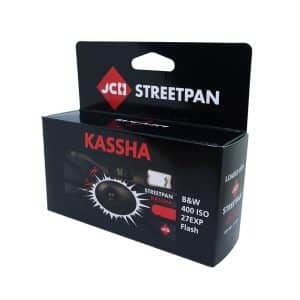 I picked one up, intending it to be a back-up/secondary lens. 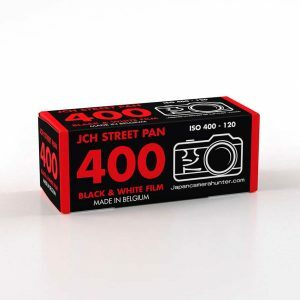 It has replaced my Leica 35mm Summicron. I was impressed with my first shots…this is a well kept secret; an under appreciated lens. BTW, my very first photo instructor (1970) was a USAF vet who had recently returned from Viet Nam. 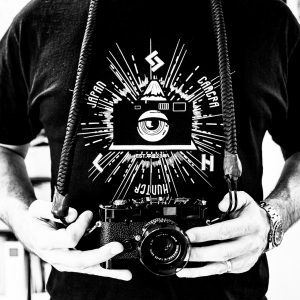 He was part of a 3 man team that included a soundman, a filmmaker and a still photographer. As protection, he carried a M79 grenade launcher. Quite a character. I learned much from him. Enjoyed the photos on your site a lot, thanks for sharing, and keep up the good work!